At the end of last week the real, proper wine writer Lettie Teague, writing in the actual, genuine Wall Street Journal, published an article about wine blogs, at the end of which she picked her five favourites. She’s American, her paper is American, the very great majority of her readers are American, and four of her chosen favourites were American too. From the entire rest of the world she picked one, and it was me. I knew she might be writing about me – she’d been in touch by email, said she liked the blog, and asked me a few questions about it, and myself. But I also feel I have a decent sense of my place in the world. If I was going to be one of her selections, how many selections would there be? Surely no less than 20, I reasoned. WSJ wouldn’t want many more, even for a web-only piece; I surely wouldn’t be in there if there were to be fewer. When the article appeared, and I was one of five … well … I must admit it blew my little mind. And it also got my father quite excited, which is quite a feat in itself. Inevitably, lots of people visited that weekend to check me out. Equally inevitably, many of them won’t be back. To any repeat visitors who first found me through that article: welcome. I hope you stick around. Hopefully we can have some fun together. Hi Simon. 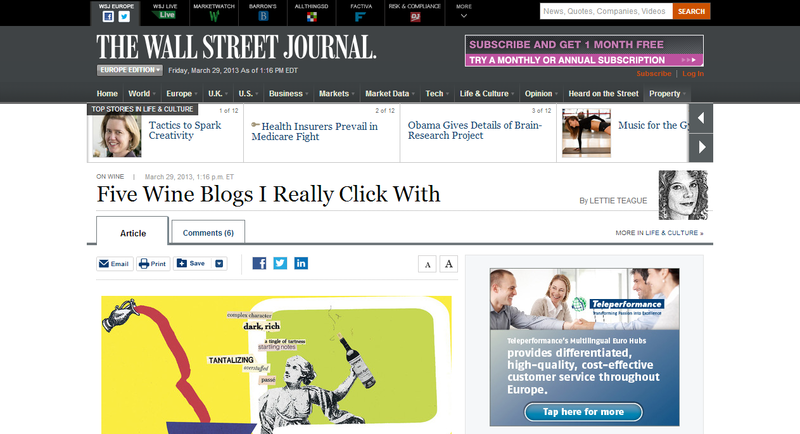 I did find your blog via the Wall Street Journal article and thoroughly enjoyed your post about wine pairing. I look forward to reading more from you! Lettie Teague is a writer I trust, so here I am! A new follower. I, too, am here from the WSJ article … which I am just now reading because it was part of the latest batch of clippings from my mother. (she also included an entire section from Books and it’s only six weeks old). I’ve visited all the blogs Lettie highlighted and have decided to follow two. Yours and brooklynguy’s. I love wine. and your writing makes me smile…and want to try some new things. Thank you! I discovered your blog thanks to the Wall Street Journal and I am happy to be here. Congratulation!